Have you seen a fight recently? If you have, there’s an excellent chance it was an Ultimate Fighting Championship event, and not boxing. Billed in its infancy as a “war of the worlds” of marital arts by founding fathers Art Davie and Rorion Gracie, The Ultimate Fighting Championship (as it was known then) started out as an (almost) no-holds barred tournament of fighters from around the globe. Any and all fighting styles were welcome, and very little was restricted within the confines of the Octagon (save for biting and eye gouging). 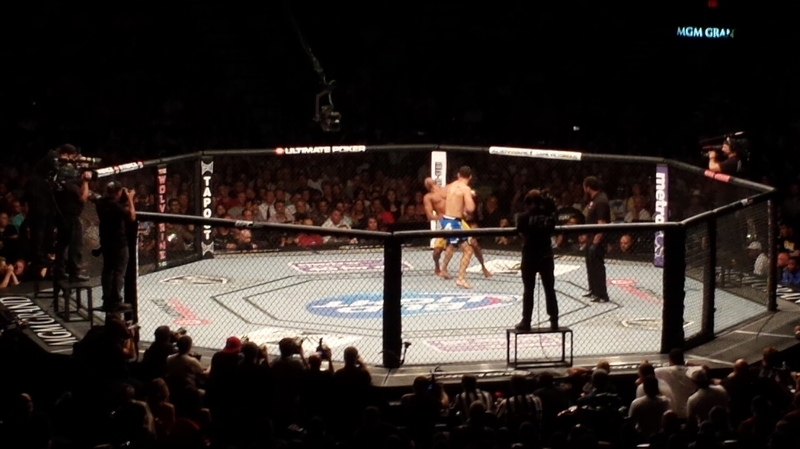 There were no weight classes, and fights were decided solely by submission or TKO. The initial pay per view did extremely well for such a new concept, drawing in over 86,000 buys in 1993. The creation of a sport was never Art’s and Rorion’s intent, but the novel concept of clashing styles and the brutality of combat had sports fans hooked, and pleading for more. With public awareness slowly building of this exciting but incredibly violent sport, it was only a matter of time before people, citizen’s groups and politicians opposed to the latter development took notice. In 1999, Senator John McCain petitioned all 50 states to ban the UFC from competing in their jurisdictions; 36 complied with his wishes, putting the popular but fledgling sport in a bind. Though there was a great deal of resistance to it, rules that would get the Ultimate Fighting Championship back on the bill throughout the USA began to emerge. Fish-hooking was banned, as was kicking the head of downed fighters, among other reforms. While they had gotten back on the map throughout most of the country in the year 2000, the economic damage done had them teetering on the edge of bankruptcy. Recognizing the value of the UFC brand, casino magnates Frank and Lorenzo Fertitta joined with business partner Dana White swept to purchase the company. With tie-ins to the Nevada State Athletic Commission, and plenty of advertising and marketing muscle at their disposal, they revived a sport on the edge of collapse, helping it resume its upward trajectory. For all their efforts up to 2005 though, growth remained stubbornly linear. At this time, reality TV shows were a hot trend that was shifting viewers away from sitcoms and toward shows based on the lives of real people. Lorenzo and Frank began to put together a show that would take advantage of this sea change in TV viewing habits, and later that year, the first season of The Ultimate Fighter aired on Spike TV. Casual fans came to know the combatants, who were fighting for a six-figure contract to star in the UFC, as human beings, and not just as mere pugilists. Viewership numbers of PPV’s from that point on began to hockey stick, going from 300,000 buys in 2005, to 1.7 million for UFC 100 in 2009. There’s nothing quite like a nice massage at the end of the day to soothe those aches and pains. No matter if you’ve been hard at it at work, or slaving around the house doing chores all day, you’ll surely agree that spending an hour or two being pampered afterwards is pure bliss. If only massages were cheap enough that we could enjoy them every day! Well, you might not be so lucky, but we can certainly help you to find such services at huge discounts. Just check out these special offers on Groupon’s health and beauty pages and you’ll be amazed how cheap it can be. 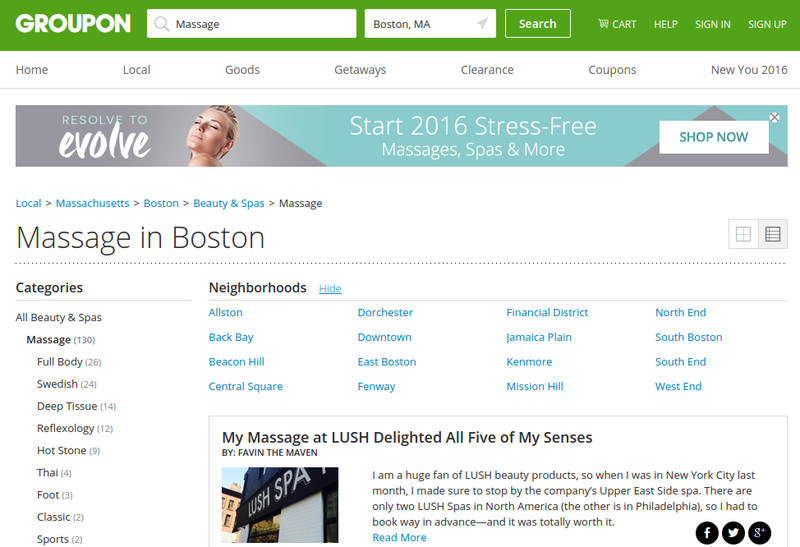 This listing for massage in Boston is a great example of the promotions on offer. Orlando is best known for its proliferation of theme parks, but this large city has delights that go far beyond cartoon characters and thrill rides. Locals love the city for more than its pixie dust. These popular destinations highlight a lesser-known side of Orlando that is well worth a visit. Nestled in the heart of Orlando, the Church Street district is popular for its night life. Things really step up around the holidays where traffic is blocked off so parties for events like Halloween and New Year’s Eve can literally spill into the streets. Popular bars like Chillers, Big Belly, and Latitudes keep things exciting year-round with weekly events and drink specials that draw big crowds. Several downtown hotels like the Grand Bohemian Orlando, Autograph Collection are just minutes from this popular area. 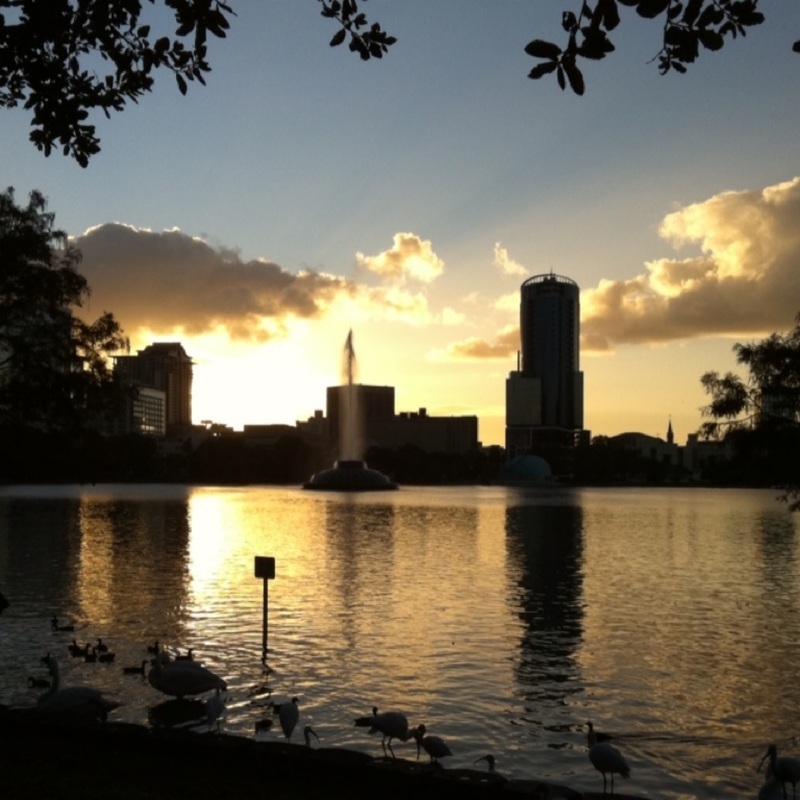 Lake Eola Park offers a refreshing patch of nature in downtown Orlando. The park is dominated by Lake Eola. The signature fountain in the middle is the icon of the City of Orlando. A 0.9-mile path circling the lake offers a popular spot to jog or stroll. The Walt Disney Amphitheater hosts live performances, and many downtown festivals take place in and around the park. Lake Eola’s best-known residents are the live swans that fill the park. Visitors can get a little swan-like themselves with paddle boat rentals on the water. Visitors of all ages can enjoy the immersive entertainment available at the Orlando Science Center. Over four floors, guests find exhibits that showcase live animals, dinosaur skeletons, and Florida farms. Children can watch bees build a hive, excavate a dinosaur fossil, or pick and sort play oranges at the Orange Grove Factory. Local parents often opt for a season pass so they can return again and again for the experiments and exploration that never get old. You can enjoy convenient access to the Science Center during a visit to Orlando with a stay at a nearby hotel like the Comfort Suites Downtown. The Dr. Phillips Center is a new collection of entertainment venues with theaters for every type of performance. The Walt Disney Theater seats over 2,700 people, while The Bob Carr Theater is only slightly smaller with a capacity of just over 2,500. 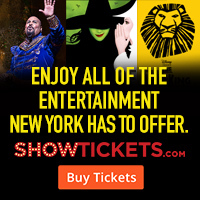 Both are ideal for Broadway performances, concerts, and other big events. The Alexis & Jim Pugh Theater offers an intimate setting with just over 300 seats and a multi-purpose space that accommodates live entertainment as well as special events like banquets. Check the center’s schedule before booking your flights to Orlando and you can adjust your stay to coincide with performances from the Orlando Ballet, Orlando Philharmonic, and others. The packed schedule includes concerts, plays, musicals, comedians, and more. While Orlando’s theme parks offer plenty of entertainment, this city’s lesser-known side offers just as much to explore. Find out what locals already know about Orlando’s diverse draws and try visiting one of these highlights in one of America’s most popular cities. Raising money for charity with a difference! The great thing about raising money for charity is that there are so many different ways in which you can do it. While lots of people choose to run marathons or organise events within their community, there’s no reason why you can’t do something more adventurous. To get you in the mood we’ve come up with a few suggestions to get your fundraising efforts started. 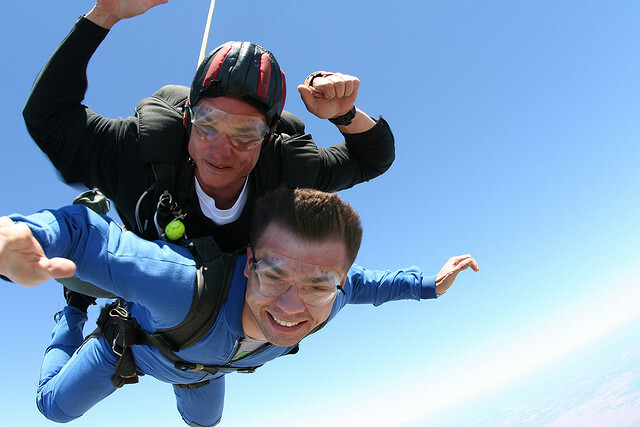 If you’re something of a thrill seeker and want to channel that energy into your charity effort then skydiving is the option for you. What’s great about it is that you can hurl yourself out of a plane with a parachute strapped to your back in so many places around the world. So, you can combine raising money for a good cause with a bit of travelling if you’d like to. Among the best places in the world to skydive are Hawaii – where you can see entire islands from the air – Switzerland, where you have views of lakes and mountains as you fall, and Sydney, where you’ll soar over the city and its nearby beaches. For an adventurous fundraising activity you can go on a longer expedition to one of the most extreme environments on the planet – the Arctic. Trekking across the frozen tundra in search of polar bears and Arctic foxes is a fantastic adventure to go on and will be made all the more enjoyable if you’re raising money for charity at the same time. You could even incorporate a crazy activity into your trip to the Arctic – such as a brief dip in the freezing polar waters to boost the amount your friends and family are willing to donate to your chosen cause. If this interests you, check out the various Arctic tours available here for some further inspiration. Mount Kilimanjaro is the highest walkable peak in the world and it’s a great endurance activity if you’re not up for running a marathon but still want to undertake a physically demanding challenge for your chosen charity. You’ll need to put in a fair amount of preparation for this climb, which will give you plenty of opportunities to raise awareness of your fundraising endeavour and possibly to even raise a little more money by undertaking smaller challenges before the main event. From a purely personal point of view, climbing Kilimanjaro is a truly memorable experience, as the landscapes on the mountain’s slopes are particularly striking and the views from Uhuru Peak are truly breathtaking. Regardless of how you decide to raise money for your chosen good cause, it’s important to generate plenty of awareness about your endeavour. Spread the word among your friends, family and colleagues, and host events to boost your funds before you head off on whatever adventure you’ve decided is right for you. Make the most of social media to tell as many people as possible about what you’re going to be doing and why. The why is especially important, as this will be what encourages everyone to give generously to your cause. There are a host of ways in which you can raise money for charity, so you can choose something that appeals to you and, most importantly, that you believe you can achieve. While it’s great to set your sights high, you need to make sure you can complete the challenge if you want everyone to donate. 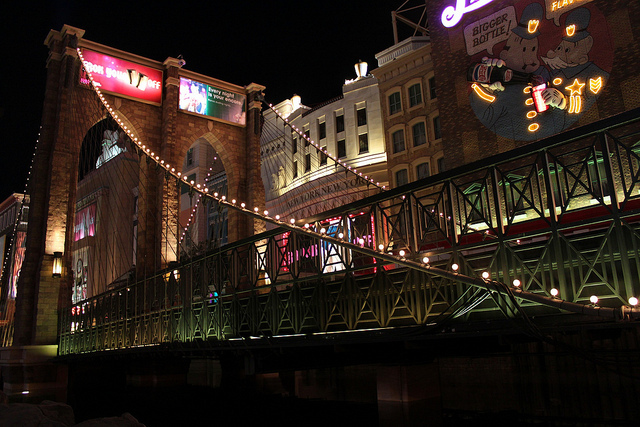 Most people traveling to Las Vegas, Nevada are looking for a bit of fun and entertainment. Gaming is the big draw to this city that never sleeps. The Las Vegas Strip is considered the place to visit because of the many hotels and casinos available for the tourists, and locals as well. It is a sight to see, especially at night. The most iconic hotels on the Las Vegas Strip are all aglow with sparkling lights and they are definitely a sight to behold. The Luxor Hotel is located between the fabulous Mandalay Bay Hotel and the fantastic Excalibur Hotel. Both are well worth a visit. The Luxor Las Vegas has some very unique features and is considered the second largest hotel in Vegas and the eighth largest in the world. All of that may sound impressive but wait until you see the famous sky beam, which on a clear night can be seen about 275 miles away by aircraft flying at cruising altitude. The Luxor is built in the shape of a pyramid and it is named after the city of Luxor in Egypt. There is a re-creation of the Great Sphinx of Giza which stands 110ft tall. The re-creation of the 140ft tall Obelisk stands proudly at the front of the pyramid inviting all in for a visit. Another wonderful hotel on the strip is the Excalibur Hotel. It is great, especially if you would like to return to the days of King Arthur and the Knights of the Round Table. 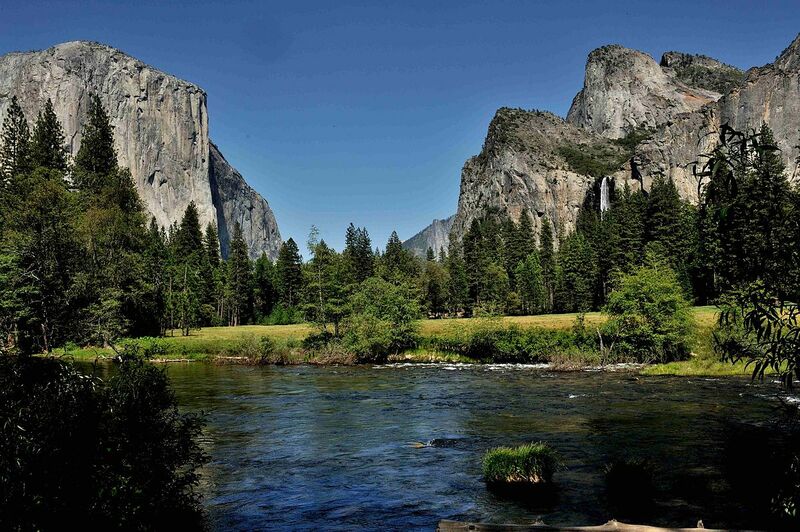 This hotel is a great place to stay for families or honeymooners because there is something for everyone and the entertainment is spectacular. Be sure to buy your tickets to the Tournament of Kings in advance. It is a good bet you will not be disappointed. The Bellagio Hotel is a luxury hotel that is a five diamond resort and seems just about perfect in every respect. There is fine food, great gaming, wonderful service and too many other attractions and features to mention here. If you have heard about the fabulous Dancing Waters of Las Vegas, then you have probably heard about this hotel. The water fountain display is just one of the many features of the Bellagio. All of the hotels on the famous Las Vegas Strip are full of fun and excitement and deserve a visit from all visitors. Each of these hotels have something unique and interesting for everyone. A few of these hotels are: The MGM Grand, Ballys, Caesars Palace, The Mirage, The Venetian, Treasure Island, The Flamingo, The Paris Hotel and Wynn Las Vegas. These are by no means all of the hotels on the Strip but all of them are worth a visit whether you are going to be staying in Las Vegas for one day or many days. Check with a local travel agent or on one of the numerous internet sites available if you would like to get more information about any one of these fine hotels. Before you go to the US, make sure to sort out an ESTA visa beforehand to avoid problems at the border or airport.